A Samoan choir sings polyphonic Polynesian hymns, haunting earth sounds, which echo off the concrete facades of the densely packed five story high apartment buildings, pressing up to the sidewalks. 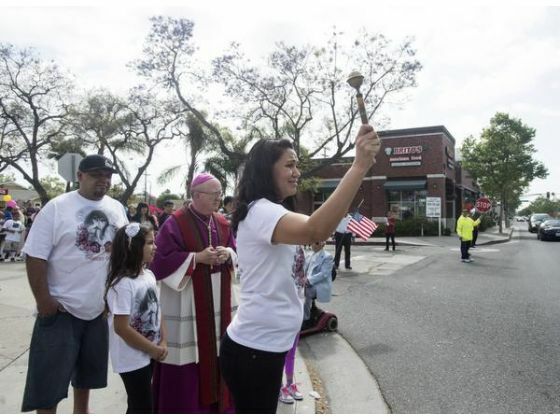 Five hundred parishioners from St. Joseph’s Roman Catholic Church and Messiah Episcopal Church in the Logan Barrio of Santa Ana, California, walk, pray and sing together, parading in a winding pattern on the streets in one of the most densely populated neighborhoods in America. 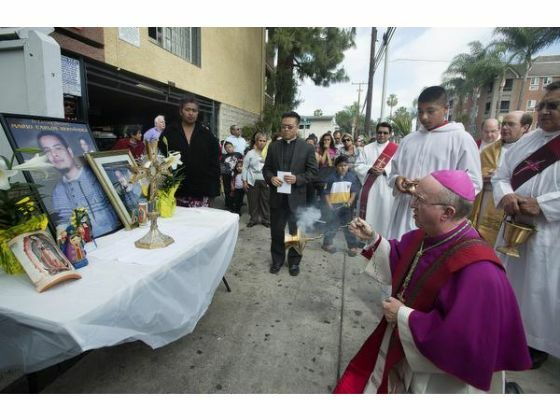 This is the annual Blessing of the Streets, which began twenty-one years ago when Father Christopher Smith of St. Joseph’s created a Christian response to the intense gang violence taking over our neighborhood. This year was a homecoming on several levels. As we began the liturgy within St. Joseph’s Church, the golden monstrance contained the blessed Body of Christ on the altar, I joined the priests kneeling, as we sang in Latin, Tantem Ergo. I gazed at the faces around me and there they were: Fr. Ed Becker, the current pastor of St. Joseph’s; Fr. Christopher Smith, pastor of the parish for fifteen years and now rector of the new Christ Cathedral in Garden Grove; and Monsg. Wilbur Davis, who was pastor here 33 years ago, when I first began as Rector of Messiah Parish. Three dear friends, all together in the parish they love: a unique homecoming. The Palm Sunday Blessing of the Streets was also special this year because Bishop Kevin Vann of the Roman Catholic Diocese of Orange joined us as principal celebrant. We sang hymns in Spanish, English, Samoan and Latin, as we walked a zig zag route to three stations of violent death. In front of the Carlton’s Apartments, a flower-covered altar surrounded a framed photo of Mario Carlos Hernandez, Jr, 20, murdered in the underground carport in a gang-related shooting two years ago. Fr. Ed brought the Bishop to meet the grieving family. I watched as the Bishop walked with the family inside the carport to the spot of the murder and invited the mother to sprinkle the space with holy water. The crowd embraced the family. 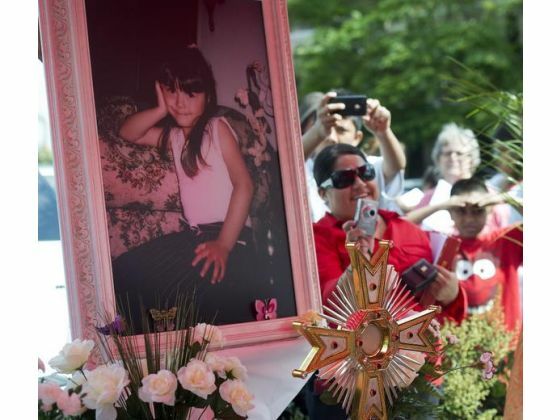 Five-year old Omara Meza killed in 2013. Fr. Christopher carries Blessed Sacrament; Fr. Brad sprinkles holy water. 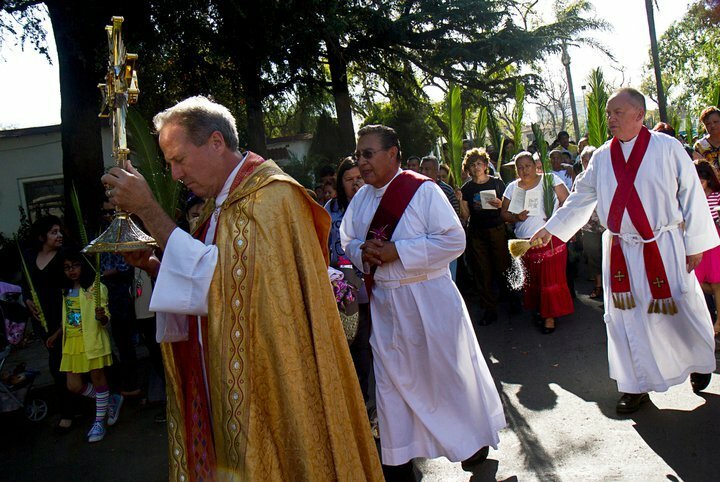 I was invited to carry the holy water bucket and lead the procession down another street. Families gazed from balconies overlooking the street and I tried to fling the blessed water up toward them. Smiles. Singing. Mothers walked up to the Bishop for a blessing for their children. The Bishop seemed to be in his element, walking comfortably deep within the dense crowd, receiving embrazos and hugs. From time to time gang bangers walked by, smoking, talking, laughing in bravado indifference. The songs continued in various languages: “the God of Love is here”, “Jesus the Prince of Peace is here,” we are here. This powerful physical presence of these good people is another sacramental expression of the Body of Christ. Just as the host in the Monstrance is a Real Presence of Jesus, these good people from these congregations are a real presence: their words and songs and processing are an outward visible sign complimenting twenty years of volunteer and ecumenical efforts, founding one of the nation’s top after school programs, award winning early childhood centers, an HIV hospice for homeless men and women served by an religious order of hospitalers, three shelters from homeless women and children and Taller San Jose, an outstanding program of job training for the at risk youth growing up in the barrio. In addition to the homecoming of three beloved priests of St. Joseph’s today, this Palm Sunday, I returned for the first time in almost three years to worship at the Palm Sunday mass with the people of Messiah Episcopal Church, where I had been pastor for thirty years. Jan and I and Erik entered quietly from a side door. I did not wear a clergy shirt, my hair was much shorter. I think half the people did not recognize me, which was wonderful. The blessing for me of this homecoming was to see the life, vitality, and energy of this place, the rainbow of people, the well-prepared liturgy and the prophetic preaching of the new rector, Father Abel Lopez. I suppose some priests returning as I have would wonder: have they forgotten me? Do they still care about me? None of these thoughts occurred to me. I carry deep gratitude for all of God’s graces that guided me through the many storms and challenges of serving this congregation. Now they are moving forward, the Gospel is preached, and these good people are working hard serving the needs of this neighborhood and being a Real Presence. This entry was posted in Blog and tagged Fr. Christopher Smith, gang violence, Messiah Episcopal Church, Palm Sunday, Real Presence, Santa Ana, St. Augustine, St. Joseph's Church. Bookmark the permalink. A very moving article and an important reminder that the Roman Catholic Church, the Anglican Communion and the eastern Orthodox all teach and believe in the real presence in the celebration of the Eucharist. Will forever cherish the experiences I have had among the Russian Orthodox Churches which I have attended here and abroad as well as when in seminary in the Anglican/Orthodox Alliance. What a beautiful description, Father Brad. It was so, so good to see all three of you last Sunday, and I wondered what it must be like for you to sit for the first time in a pew while someone else stood at the altar. I’m glad you saw the life and energy of the parish because this is the result of your many years shepherding us. Of course, we continue to grow and develop as a congregation, but you planted seeds that will live on long into the future at Messiah. Thank you for all I learned from you…and all that I continue to learn by following your blog. I hope you’ll come back and visit more often.